It’s that time of the year when you’re expected to capture the moment. Just hopefully not in a gonzo, Blair Witch Project, network-cameraman-running-away-from-a-fanatical-Cairo-mob kind of way. 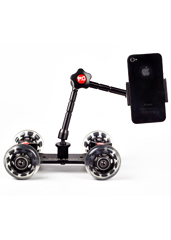 Enter the Camera Table Dolly, available now to steady your efforts at amateur videography. This thing is elegantly simple: a small, aluminum base with wheels and an arm to hold your camera or smartphone, so you can easily track a moving subject or pan across a large group. Or yes, a single person in a super close-up, like a slow, wide-panning shot that just happens to reveal a very special elf under some mistletoe. Or go all Scorsese and pull off a five-minute Steadicam shot (we suggest the Jetway at Dulles Gate B24). This thing’s got a couple extra tricks up its sleeve as well: the wheels pivot and the chassis supports a standard photo tripod and as big a lens as you can carry. So bring it with you to Atlanta to get a panoramic shot of the Chick-fil-A Bowl as you circumnavigate the club level. Nothing says “cinematic genius” like the Chick-fil-A Bowl.